Add some personality, pizzazz, and function to your outside living environment with affordable Amish sheds and garages in Loysville, PA from Glick Woodworks. We offer a wide assortment of sturdy, eye-pleasing custom sheds and outdoor structures designed to provide long-term value for anyone in Loysville or the surrounding areas. Whether you’re looking for a place to store yard care essentials or a spare vehicle, we’ll steer you towards the structure that’s just right for your needs and available budget. We build our Amish sheds based on what matters most to our customers in places like Loysville, PA. Because of the versatility and flexibility with our designs, Amish built sheds from Glick Woodworks can work just as well on larger properties as they can in smaller yards with limited space. Simply find a model that’s right for your exteriors. Let our Amish garage builders customize a garage that’s perfectly designed to safely and comfortably hold your vehicles or other items. Amish built garages from Glick Woodworks can range from basic single wide garages to more intricate two story single wide garages. Our seasoned garage builders can also create garages built on-site if you prefer even more customization options. Our fashionable, secure garages are designed to stand up to the weather conditions common throughout Loysville and surrounding areas, which means our Amish garages can easily be a smart, long-term investment. Custom garages can be a perfect way to protect everything from cars you use daily to collectable vehicles you want to keep in mint condition. Some of our garage models can also serve as the ideal spot to store ATVs, motorcycles, mountain bikes, and any other vehicles or equipment you wish to store. If you go with a double wide garage, you can enjoy even more usable space! What’s great about our Amish sheds and garages is that they can serve many purposes – even ones that are a bit out-of-the-box. For instance, one of our elite garages can serve as a workshop or a spot you use to entertain in the summer. And because our high wall barns have extra-high walls, you could open the doors and let it serve as a children’s play area, or perhaps it can become a place to keep your holiday decorations or other items. You can even use some of our Amish garages and sheds as places to store some of your household items – e.g., seasonal clothing or items only used certain times of the year – to free up space within your home! 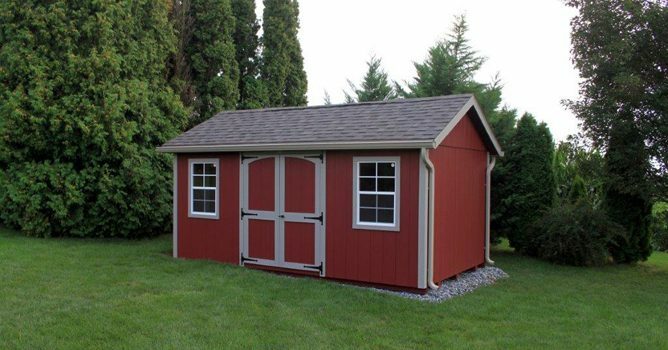 Amish built garages and sheds from Glick Woodworks are some of the best quality outdoor structures in Loysville! In fact, our outdoor structures can create a beautiful new focal point in your yard or perfectly complement your home’s architectural style. This is especially true with our custom buildings, which can be crafted as per your requests. As far as quality goes, many of our structures are built with materials from trusted names like LP Building Products, Georgia-Pacific, and IKO. We’ll even offer advice and help point you in the right direction if you need some help turning your ideas into something practical and aesthetically pleasing. Check out our gallery to get some inspiration. After all decisions have been made, our Amish built garages and sheds are expertly delivered to their new homes. Our skilled crew will deliver your new structure to your property in Loysville. A special mechanism called a “mule” will then be used to position it correctly. We’ll make sure your new structure is properly set up. You’ll appreciate knowing that the first 20-miles of delivery are free! We also handle shed removal, when necessary. Learn about our shed delivery services for yourself to get a better idea of what you can expect from Glick Woodworks. As dedicated Amish garage builders serving the Loysville, PA, area, we take pride in delivering high-quality products promptly and affordably. Contact us today to talk to someone from the Glick Woodworks team about your custom shed or custom garage preferences. "We love our shed, and the service and delivery were excellent. Also, you guys have the best price and quality of all other shed businesses. "